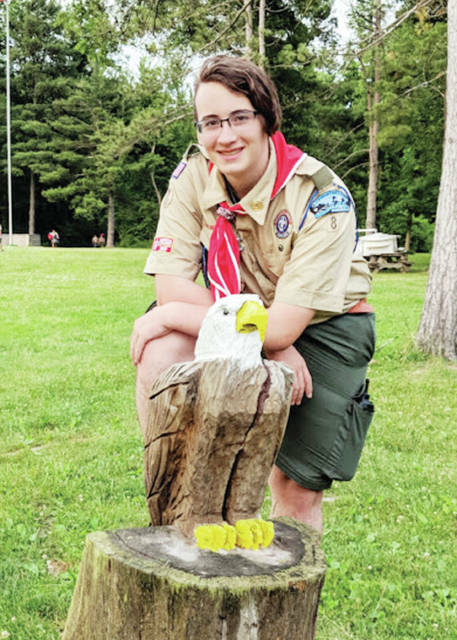 Levi Perkins, a member of Boy Scout Troop 8, and a resident of Wauseon, has earned the honor of Eagle Scout, the highest rank possible in Boy Scouts. He will receive the award at a Court of Honor ceremony early next year. Levi will be the 48th Eagle Scout in Troop 8 since it was chartered by Christ United Methodist Church in Wauseon in 1939. The 16-year-old Wauseon High School student has worked for over four years to complete the 21 merit badges required to receive the rank. His Eagle Scout project was to install over 50 tree identification signs at the Indian Hill trail adjacent to Homecoming Park. He proposed the project to the Wauseon Rotary Club and was given approval to make and install the signs, which educate the public about 24 varieties of trees found at the trail. The signs were funded through a donation from George Stuckey, whose family previously owned the property where the trail is located. Of the merit badges necessary for the Eagle Scout rank, Levi was especially commended for earning the hiking badge; he was required to complete a 20-mile hike in one day. Requirements for the rank also included serving in responsible troop positions and completing a community service project. Levi began as a Tiger Cub in first grade, and has been active in the Boy Scouts for 10 years. He is the son of Randall and Rachel Perkins of Wauseon; the grandson of Joseph and Marita Perkins of Maumee, Charles Wisda of Archbold, and Patricia and Roger Speiser of Defiance; and the great-grandson of Kenny and Helen Bell of Stryker.